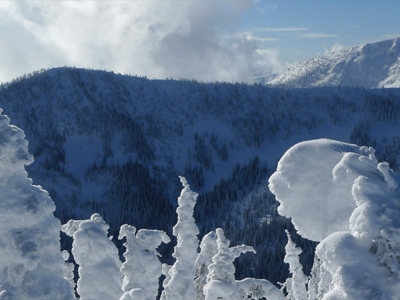 To share any info you have on backcountry skiing in the Rossland Range, or to get the lowdown from others, check out our backcountry skiing Forums on the region. 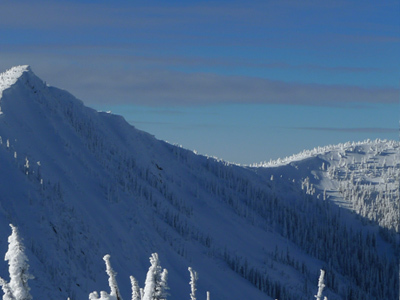 The Rossland Range is a subrange of the Monashee Mountains of the Columbia Mountains, located between the Columbia River and Big Sheep Creek in BC. The range is roughly bounded by the cities of Grand Forks, Castlegar and Trail. A portion of the general massif that forms the range crosses the border and goes down the Columbia River as far as Kettle Falls. We have featured nine routes here which come off either Mt. Plewman, Old Glory Mountain or Mt. Kirkup. 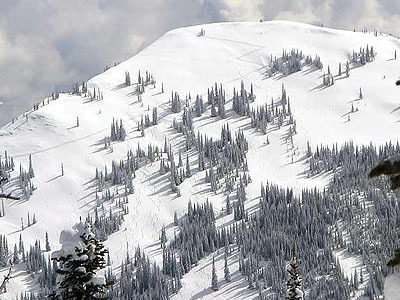 Though some routes are near to Red Mountain Resort, none of these Rossland Range routes are lift accessed. To read about routes off Red Mountain Resort, which is just to the south, click over here. 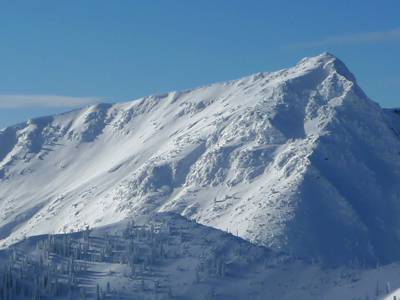 As with just about any area in the West Kootenay, the Rossland Range is known for its copious snowfall—averaging in at about 12 metres (42 ft). 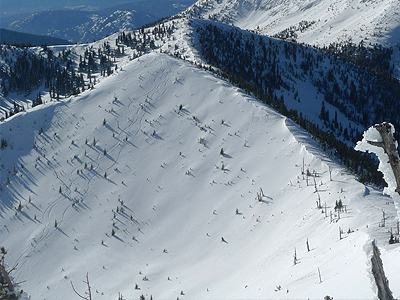 Check out the Kootenay Boundary Avalanche Forecast on the CAA site for the info you need on conditions before venturing out. Approach: Follow the same trail as for Mt. Plewman starting at the Hanna Creek/Old Glory trailhead. After approximately 4.5 kilometres of climbing, you will leave the route to Plewman, heading east to the base of Unnecessary Ridge. Climb steeply up Unnecessary Ridge and then descend 50m/160’ west to the base of Old Glory. From there, proceed southward, crossing the bottom of the obvious avalanche paths on east Old Glory. Ascend steeply southeast towards the south shoulder of Old Glory and proceed up the shoulder northwards to the summit. The Goat Chutes is a steep line off the east-northeast shoulder of Old Glory. They require commitment, route finding and strong snow stability assessment/management skills. Aesthetically, it is one of the nicest lines on Old Glory. Navigate the series of chutes to the bottom. It helps to spot your line on the approach. 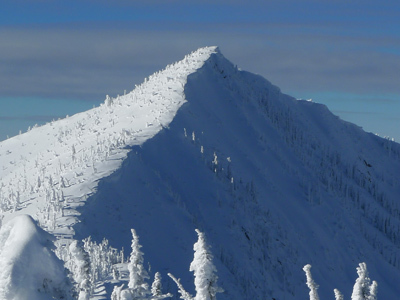 The East Face starts off from the summit and traverses skiers right across the top of the east face below the steep headwall before descending down the open face, through an hourglass formation and onto the curtain below. 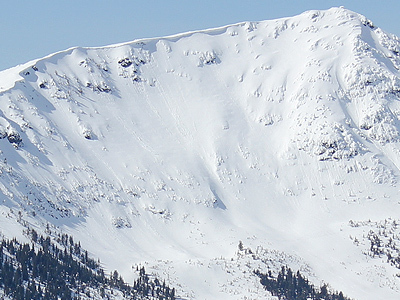 Like the Goat Chutes, there is significant exposure to cornices above and avalanche start zones. Strong snow sense and assessment is required. The South Ridge is the safest and easiest route from the top. Ski down the south ridge from the summit to where the up track crested the ridge. From there, follow the up-track down through the trees, taking caution as you cross the obvious slide paths on the east face of Old Glory. This is the return route from Old Glory to the trailhead. After skiing Old Glory, ascend the approach track 50m/160’ to Unnecessary Ridge. From here there are multiple lines so if possible spot your preferred descent on the approach, or follow the up-track down. A fun, short route is to drop down the east open face often referred to as The Darkside. From here you can climb back up the ridge for another run or go to adjacent Plewman proper or East Plewman. The south side of East Plewman is a fun, moderate run that puts you back on the skin track to return to your vehicle. ACCESS: Highway 3B. Ski up Plewman basin to the open bowl north and below Plewman proper. You should be able to see Plewman to the north, and a smaller peak (your destination) to the left and East Plewman to the right. Climb up the obvious ridge to the top of the smaller peak to the left. 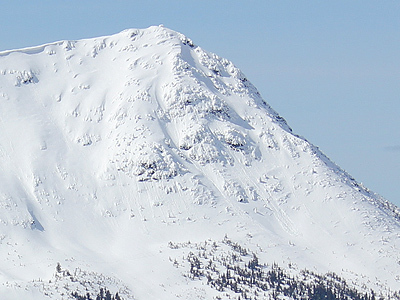 Any line can be skied off of this peak, but note the south face is subject to wind and sun, and slides often. The south face of Plewman proper is a fun, open run but as with the Darkside this moderately steep slope can be unstable and good snow sense and decision making are warranted. From the bottom you can ski down the skin track to your vehicle or do another lap in the area. ACCESS: Highway 3B. Proceed from the open bowl towards the ridge between Plewman and East Plewman (north). Once on the ridge, traverse west to the summit of Plewman Proper. From here there are a number of options, but the longest run that puts you in proximity to the skin track is directly south off the summit, linking wide open, 25-30 degree slopes. This is moderate terrain and relatively safe when avalanche conditions are high. However, good snow sense and decision making is still warranted. It is south facing so can be sun affected. ACCESS: Highway 3B. as per Plewman Proper, from the open bowl proceed towards the ridge between Plewman and East Plewman (north). Once on the ridge, traverse east to the summit of East Plewman. From the Summit, drop in to skier's right and navigate open sections through the trees to the bottom of the first open section on Kirkup, ending where the up track emerged from the treed uptrack. Be cautions on the drop-in off the summit as it is often wind-loaded and prone to slide, especially after recent storm cycles. From here, roughly follow the open fields as per the up track back to the highway. The Right and Left lines offer a couple of nice options to yo-yo North Kirkup for a several hour tour. ACCESS: Highway 3B. Park at the Old Glory trailhead and proceed up the Glory trail for approximately 50-100 metres. From there, climb south (left) steeply up through old growth until you reach a clearing. From there, traverse right (southwest) and up through the clearing aiming for the high right corner. Proceed through a short strip of trees to another clearing, from there, continue to traverse up (southwest) to the far corner of this clearing, getting steeper as you near the forest. From there, traverse at the same angle (up and to the right) through denser forest until you reach the bottom of the main run. 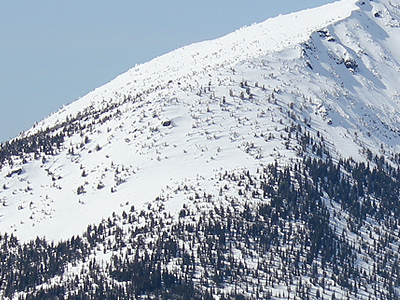 From there, climb directly up through patchy forests to the northeast ridge of Kirkup. Proceed west on the north side of the ridge to the summit. Note: the top of Kirkup, while unassuming, is prone to slide. Check conditions and take the necessary precautions. From the summit, drop in skiers left and navigate the open sections through the trees to the bottom of the obvious open areas. From there, traverse right to join the up track. As per Kirkup North Right, be caution on the drop-in from the summit as it can be wind-loaded and prone to slide. From here, roughly follow the open fields as per the up track back to the highway. The Right and Left lines offer a couple of nice options to yo-yo North Kirkup for a several hour tour.